Discover how to be creatively mindful. Free creative activities and fresh insights to keep you feeling alive and connected to all that matters. Hello, and welcome to the Creative Mindfulness Blog. Here you'll discover how to have a more a creative mindset. One that can boost your self-esteem, confidence and sense of life purpose. The articles you'll read here are about helping you think more creatively so you have the skills to solve problems, make better life choices and reach your goals. It’s written by creative arts therapist and life coach, Barbara Grace. Creativity is not only for artists - although an artist's toolkit can offer a practical pathway. ... you could solve problems more quickly, come to deeper insights more readily and 'see' the simple solution in the complex challenge because you think more creatively and flexibly than anyone around you? Creating perspective - one of the activities in the creativity course. What would this do for your work, your relationships and your personal satisfaction in life? Engineers, scientists, mathematicians, parents, children, writers and leaders (along with most professions and roles in life) need a creative mind to be successful. In fact - if creativity is not infused into your daily routine, stagnation usually results - and like a garden where soil is depleted of nutrition, plants un-watered and kept in the dark - creativity withers and dies. Creativity is about looking at things from fresh and varied perspectives, so you don't 'assume' or let the mind fill-in-the-blanks without really looking. Creativity means continually feeding the source (your brain) with inspiring material, interesting challenges and the time to bring creative insights towards the surface. Let's take a look at one area that blocks creativity. In this post you'll have the chance to do some simple exercises to help raise your awareness and curiosity. I encourage you to dive in and explore, because it is in the 'doing' that you will stretch your ability to think more creatively. Creativity begins with raising awareness of everything around you and then being curious about what you're seeing, hearing, feeling, tasting or smelling - it's about not accepting a 'surface' level response to the everyday things you see, hear, feel or do. We’ve all met people who say, “I’m not creative” as if that’s the end to it. Done deal. Yet this suggests that anyone who isn't creative lacks insight and limits their chance to live a richer more intuitive life. Creative thinking is a gift we're all born with. It's how we've learnt to solve problems - from crawling to walking, getting a job or building a business. We may differ in how we apply creative thinking, what level of creative intuition we use, or our creative style – yet each one of us needs to continue building creative muscles to expand awareness, solve problems and experience new insights. Are You Guilty Of Perceptual Stereotyping? When beginning a creative process to solve a problem (whether it's to do art or work on an engineering problem) it's important to break through the tricks your mind creates. These 'tricks' help you make sense of a problem's framework quickly - yet if relied on as the only tool can distort and limit how you see problems, ideas or solutions. Why? Because 'perceptual stereotyping' only lets you see what you expect to see. While you know that stereotyping people and labeling them into ethnicity, gender, sexual orientation, age, disability, wealth, education or job titles limits a person's ability to see people as individuals, most of us continue to use it when solving problems in our lives. For example, look carefully at the image to the left – are the horizontal lines straight or bent? How you 'see' the lines is influenced by what sits near or adjacent to the 'thing' you're looking at. In this case black squares. For your mind to make sense of this, meaning is found by looking at the edges and finding a point of reference. It's a form of pattern making, which your perception battles with because what you're perceiving 'shifts'. You're asked to 'see' in a different way. And at first it can feel confusing. It's much the same with life problems. We want to see the linear approach, find the pattern and create a point of reference. 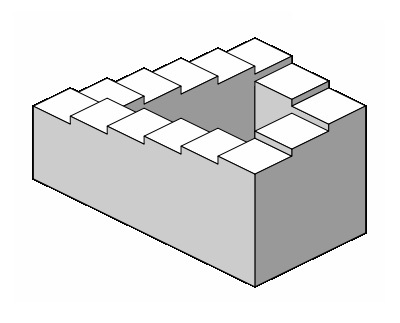 Unfortunately life's challenges rarely follow a linear perspective and are confounded by life's illusions. Yet the question is, Is it possible to remove yourself from stereotypical responses when you're trained to think in a certain way since childhood? The answer must be 'yes' - because without this, the ability to see through a fresh lens becomes more and more difficult as we grow older. Thinking becomes fixed and rigid rather than open and flexible. Do you relate? How many times do you respond with an 'auto-pilot' response rather than from a place of real awareness? It may be through how you relate to a boss or a person who 'rubs you up the wrong way'. How do you think this form of 'judgement' and stereotypical response could be limiting your own ability to 'see' creatively so that you can expand what's possible in your life? Look at the image below and notice how your eyes jump depending on whether you're looking at the right end or the left end of the drawing. There's a mid-point where your eyes begin to 'see' something different and your perception shifts. Consider a time in your life when you've believed something wholeheartedly only to discover later that you didn't have all the information needed to 'see' the problem clearly from another perspective entirely. How many times have you done this in your relationships - whether with parents, partners, co-workers, siblings or your children? Creative thinking relies on suspending judgement and pressing the creative 'pause' button to look without dismissing alternative ways of seeing. How could you begin to 'see' without making over-fast judgements? How Can You Hold This 'Tension' Without Jumping To Conclusions? What will it take for you to hold this moment of tension without jumping to conclusions that may be shutting down further possibilities because your mind has come to a conclusion just to make sense of a problem (or a situation) quickly? We live in a world of fast - fast decisions, fast reactions and fast interpretations; yet, the pace is slowing insight and independent thought. This next image (to the left) also seems at odds with what your mind can make sense of. It seems impossible to go up, while also going down. Yet, as an analogy of life - that's what most of us do - head down a certain pathway only to find we're in an uphill battle against odds we hadn't considered. And this is the creativity of insight - to prepare one's mind for the 'impossible' while pursing the 'possible'. 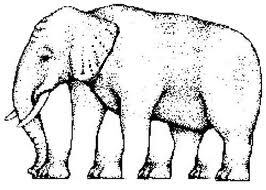 And my favourite ... how many legs does this elephant have??? Draw one (or all) of the above visual illusions in your journal and experience how your perceptions change as you’re drawing. As you're doing this, consider a problem you're dealing with at the moment - and reflect on whether your perception of it is an illusion and could have an alternative perspective. Perceptual stereotyping can be a serious handicap when aiming to perceive new combinations of ideas. It can hinder the ability to see how things can be used in different ways. You’ll probably have experienced this in your own life – once a label has been applied to you – regardless of whether you are a teacher, a nurse, a housewife or an athlete, people are less likely to notice your actual qualities or individual attributes beyond the label. It’s easier for our brain to code information and chunk or group it with similar experiences/memories for easier retrieval later. This helps categorise the plethora of information coming at us daily and keep relatively similar ideas together. The problem is, that over-generalising limits our ability to see things from a fresh perspective. Creative thinking is about choosing to see the 'fresh perspective' rather than living with the quick 'categorisation' that's often given for the things encountered everyday. Building a creative muscle is a process for 'seeing' more clearly. Can Learning To Draw Help? Learning how to draw and express an image visually is one of the strongest ways I know to expand creativity. Because it slows you down. It asks you to sit with a problem - a particular problem of how to do a visual representation of what you're seeing. In slowing down your thinking you take the opportunity to draw what's there - not what you think is there. It's similar to hitting a golf ball with a club. I was taught to never take my eyes off the ball. Every time I did - I missed. Same with drawing - it's about trusting yourself to focus and learning how to follow simple processes that creative results follow. And this is the difference between someone who can express themselves creatively and someone who struggles to do this. Those who struggle (and feel their drawings are 'child like') are often caught in the idea of relying on what they 'think' a face looks like - in other words they're relying on a schema developed as a very young person - one that often hasn't been updated as they've matured. It's when you slow the process down and reflect what you 'see' that your drawing reflects reality more. The same skill applies in being a leader, running a business or mastering any skill whether it's in sport or playing an instrument. The power of observation is important because our brains have been trained to 'think fast', perceive quickly and not be caught up in minutiae - yet the small details that are over-looked are often the ones that offer creative interpretations that lead to breakthroughs and greater insight. To the right is a classic concept of how our mind 'creates' what isn't there. Imagine what you could do when your creative mind expands enough to generate new insights that could help you work, relate and live more in tune with 'what is' rather than a perceptual stereotype. When I teach people to draw and create - we begin with stripping things back to the most simple elements. Using one element alone (such as one colour, one type of line or one shape) shows how creativity is more aligned with simplicity than complexity. It's then possible to see the nuances in the subtle and the often over-looked. creating a landscape using only one colour - one of the creative activities in the course. So, my question to you is this: What's one thing you could do today to amplify one element of your life so you get to be more curious about how it intersects with what you're feeling? For me, colour is a particularly strong driver. I love how it reacts with light. It influences my energy, my pace and what I notice (or don't). Taking a walk and absorbing the colour and light helps me notice people, how buildings shape the skyline, how a breeze ruffles leaves. It's like stepping into a movie scene as a silent witness to all the elements needed to create a 'mood'. What is it for you that ignites your curiosity, I'd love to hear. Please leave a message below and share. Discover the gentle art of creative mindfulness and help change lives. Coaching with creativity is a natural way to feel more confident so you live with greater meaning and purpose in your life. Discover "Coaching With Creative Mindfulness"
A fresh approach to living with more mindful presence. See how tiny daily habits reveal 'patterns' that may be sabotaging your goals, your dreams, your life. I have worked with people for over 30 years as educator, coach and therapist. While no one tool can meet everyone's needs, I believe Creative Mindfulness is a way of connecting with what lays beneath the surface of our conscious mind - and it is here that the greatest change work can happen in a gentle and guided way. I invite you to join me for a journey where your innate creativity is re-kindled as a tool to bring awareness to your values and how they could be impacting the way you relate to others - and more importantly yourself.